Diversity among Peace Corps Volunteer groups serving overseas is crucial to the success of the entire program — for many reasons. Peace Corps promotes person-to-person diplomacy, and aims to increase understanding among people of other countries about the United States. Without recruiting Volunteers who reflect the rich array of cultural and ethnic and racial heritages that make up U.S. communities, host country nationals in Peace Corps countries can’t begin to grasp the ways of life that exist here in the United States. 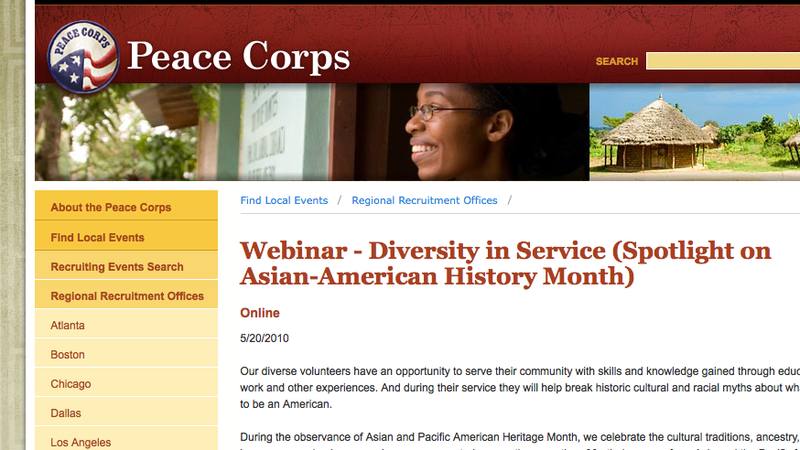 Tomorrow Peace Corps will highlight and celebrate the contributions of Asian and Pacific Americans in Peace Corps service. Last year, hundreds of Asian and Pacific Americans served as Peace Corps Volunteers, providing needed skill sets and services to Peace Corps host countries. Returned Volunteer Mike Buff — of South Korean descent — will host an online information session tomorrow at 9:30 am Pacific (12:30 Eastern) to talk about Peace Corps, and his experience serving in Jordan’s youth development sector (2006-2008). Mike is going to talk about why he joined Peace Corps, and about the program’s three goals. He’ll also go over the application process and leave time to answer questions from you! This entry was posted in Applying, Corps & Coalitions, Inclusion, International, Opportunities, Stories of Service. Bookmark the permalink. Great topics. Thanks in advance.